Animals across the board adopt a broad array of defense tactics in fearful and anxiety-inducing situations. Some feign their own death. Some seamlessly blend into their surroundings via camouflage. Some of them even dissuade their enemies through letting off highly unpleasant odors. These defensive behaviors are all common in the snake world. Snakes of both genders are equipped with cloacal glands that are situated on their tails' foundations. These glands flank their vents, or their excretory openings. Their cloacal glands manufacture disagreeable smelling substances that snakes emit when they feel bothered or frightened by others. Not only do agitated snakes often let off these icky odors, they also sometimes let go of their viscous intestinal matter. Snakes sometimes toss their bodies around in the stuff. If they're in the clutches of an enemy, they often rub it onto them, too. Snakes are sometimes irritated when people try to touch or hold them, and as a result frequently emit defensive odors in those situations. Snakes don't let off these undesirable odors for no reason. When they do so, they're trying to make themselves less appealing and delicious -- as potential meals -- to possible predators. If a snake has a disgusting odor all over his physique, a predator probably isn't going to find him as enticing. Predators aren't usually as interested in dining on things that smell so awful. If something smells awful, there's a strong chance that it will have a flavor that's just as awful, after all. The odors that threatened snakes give off run the gamut. The smells are often reminiscent of those of rotting animal carcasses. They generally depend on the specific variety of snake, however. 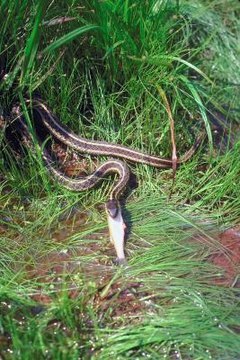 Garter snakes (genus Thamnophis) emit odors that are overwhelmingly cloying. Rattlesnakes (genera Sistrurus and Crotalus) emit odors that are intensely musky and strong. While the odors that these reptiles give off are usually deterrents to human beings, snakes sometimes employ them for purposes beyond self-defense. Some types of snakes are thought to occasionally utilize their cloacal glands to lure potential mates, too. Defense techniques in snakes go far beyond simply emitting repugnant odors. Many snakes defend themselves just by escaping the fearful situations. Some produce noisy and ominous hisses to get their threats to go away. Some snakes even expand their necks to confuse their opponents into thinking that they're significantly bigger than they are in reality. It also isn't unheard of for some snakes to bite -- and inject poison -- into their enemies. Bites of many snakes can be hazardous and even fatal, which is why it's crucial, for safety reasons, to always leave wild snakes alone.